This name uses Spanish naming customs: the first or paternal family name is Lladó and the second or maternal family name is Cánovas. Gisela Lladó Cánovas (born January 1, 1979) is a Spanish pop singer and a Spanish dub actress. She was born in El Bruc (Barcelona), in Catalonia, Spain, and became famous after placing eighth in the first Spanish edition of Operación Triunfo . Before she was a journalism student at the Autonomous University of Barcelona. She is also known for representing Andorra in the Eurovision Song Contest 2008 in Belgrade, Serbia, failing to reach the final. El Bruc is a municipality in the comarca of the Anoia in Catalonia, Spain. It is situated on the side of Montserrat, of which the north-western third is within the municipality. A local road connects the village with the main N-II road from Barcelona to Lleida, and to Monistrol de Montserrat via the monastery. Barcelona is a province of eastern Spain, in the center of the autonomous community of Catalonia. The province is bordered by the provinces of Tarragona, Lleida, and Girona, and by the Mediterranean Sea. Its area is 7,726 km2 (2,983 sq mi). 5,609,350 people live in the province, of whom about 30% (1,620,343) live within the administrative limits of the city of Barcelona, which itself is contained in the Barcelona metropolitan area. Her first album, Parte De Mí, came out in Spain in 2002, selling 260,000 copies in a few weeks. That year she also performed at the Eurovision Song Contest 2002 in Tallinn as a backing singer for her friend Rosa López. In 2003, she won the award for best voice in the Viña del Mar International Song Festival and she won the competition with the song Este Amor Es Tuyo. Rosa María López Cortés,, is a Spanish singer. She came to fame in 2001 as part of the Spanish reality television talent show Operación Triunfo, which she won. She represented Spain in the Eurovision Song Contest 2002. She has subsequently released seven studio albums, a DVD and several singles. Her second album in 2003, Más Allá has five singles, including Más Allá (and Catalan version: Més enllà), the No.1 Sola and Amor Divino. Also in 2003, her version of Irene Cara's "What a Feeling" was included in an advert in the United Kingdom. Irene Cara Escalera, known professionally as Irene Cara, is an American singer, songwriter, dancer and actress. Cara sang and co-wrote the song 'Flashdance... What a Feeling', for which she won an Academy Award for Best Original Song and a Grammy Award for Best Female Pop Vocal Performance in 1984. Cara is also known for playing the role of Coco Hernandez in the 1980 film Fame, and for recording the film's title song 'Fame'. Prior to her success with Fame, Cara portrayed the title character Sparkle Williams in the original 1976 musical drama film Sparkle. Her third album, Ni te lo imaginas, came out in 2006, under a new record label (Filmax, rather than Vale Music). There were four singles off the album, the first and the third becoming Gisela's most successful so far in her career. The first was Turu-Turu, a pop ballad reaching No.1 in Spain on its second week. Filmax released a Special Edition version of the album, including two new songs, the first called Mi mundo eres tú and the second, Viviré en tus sueños. Return to Never Land is a 2002 American animated fantasy-adventure film produced by Walt Disney Television Animation, and released by Walt Disney Pictures and distributed by Buena Vista Pictures. The film is a sequel to Walt Disney Feature Animation 1953 film Peter Pan, It is based on J. M. Barrie's novel Peter and Wendy, and had a worldwide gross of $109 million. Barbie as the Princess and the Pauper is a 2004 American-Canadian direct-to-DVD computer animated musical fantasy film, and the first musical in the Barbie film series. It is directed by William Lau and stars the voice of Kelly Sheridan as the Barbie protagonists, Anneliese and Erika. The film is loosely inspired by the Mark Twain novel The Prince and the Pauper, but unrelated to the 1939 film The Princess and the Pauper. Gisela was confirmed as the Andorran representative to perform in the Eurovision Song Contest 2008 with the song "Casanova". The song failed to reach the final as it ended up in the 16th of the semi-final contest. "Casanova" is a song by Spanish singer Gisela. It was chosen to represent Andorra in the Eurovision Song Contest 2008. It is sung in English, although it features one line in Catalan. 2007 "Ni Te Lo Imaginas [Special Edition]"
2003 "Amor Divino" 10 - Más Allá / "Més enllà"
Azúcar Moreno is a Romani Spanish music duo consisted of sisters Antonia "Toñi" and Encarnación "Encarna" Salazar. The duo has sold more than 3 million albums and singles since 1984 domestically, and became famous in Europe, the United States and Latin America in the 1990s, with approximately 12 million albums sold worldwide. María de los Ángeles Felisa Santamaría Espinosa, professionally known as Massiel, is a Spanish pop singer. She won the Eurovision Song Contest 1968 with the song "La, la, la", beating the British pop singer Cliff Richard's "Congratulations". Maria Rosa Marco Poquet better known by her stage name Salomé is a Spanish singer. Elisabeth Rodergas Cols, better known as Beth, is a Spanish singer and actress. Edurne García Almagro is a Spanish singer, actress, and TV presenter. She rose to fame in late 2005 when she took part in the Spanish casting show Operación Triunfo on TVE and finished in sixth place in 2006. She represented Spain in the Eurovision Song Contest 2015 with the song "Amanecer" where she finished in 21st place. "La, La, La" is a song which was performed by the Spanish singer Massiel at the Eurovision Song Contest 1968 in London, winning the contest for Spain in that year. Massiel also released the song in English as "He Gives Me Love ". Marta Roure i Besolí is an Andorran singer and actress. She represented Andorra in the Eurovision Song Contest 2004 with her song "Jugarem a estimar-nos", earning the eighteenth place in the semifinal. It was the first time a song in Catalan language was performed at the Eurovision Song Contest, as well as Andorra's debut at the competition. María Dolores Amaya Vega, better known by her stage name Remedios Amaya, is a Spanish Romani flamenco singer. She represented Spain at the 1983 Eurovision Song Contest. María del Sol is a Mexican singer. She is the daughter of lawyer Alonso Echánove and the actress/journalist Josefina Echánove and the younger sister of Peggy Echánove and actor Alonso Echánove. María del Pilar Sánchez Luque, better known by her stage name Pastora Soler, is a Spanish singer. She is also a songwriter and her compositions usually mix copla or flamenco with pop or electronic music. The small principality of Andorra selected its participant for Eurovision Song Contest 2008 by using an internal selection. This selection process was criticized by the Association of Andorran Musicians (ASMA) who believed that abandoning the national selection process in favor of an internal selection effectively blocks the public participation of Andorran artists. Nevertheless, RTVA announced that Andorra would be represented by former Operación Triunfo contestant, Gisela. On 10 December 2007, the Andorran television broadcaster held a press conference to present Gisela and to announce that the Jordi Cubino composed "Casanova" would be the Andorran theme in Belgrade. The entry in its entirety was presented through the promotional video that aired on February 26, 2008. María Isabel Llaudes Santiago, better known by her stage name Karina, is a Spanish singer who had her biggest success in the late 1960s until the mid-1970s. She was born in Jaén, Andalusia to Trinidad Santiago and Salvador Llaudes. Anabela Braz Pires is a Portuguese singer and musical theatre actress, best known in Portugal by her first name, Anabela. 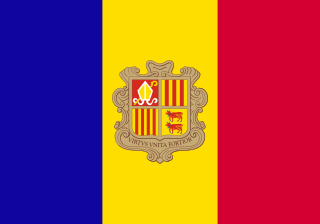 Andorra participated in the Eurovision Song Contest 2009, as previously confirmed by Andorran broadcaster Ràdio i Televisió d'Andorra (RTVA). Spain participated in the Eurovision Song Contest 2002 with an entry selected through the first series of the reality casting show Operación Triunfo. Rosa with the song "Europe's Living a Celebration", composed by Toni and Xasqui Ten, was chosen through televoting by the Spanish public. Jackeline Fabiola Rodas Valladares Fabiola Roudha is a Guatemalan singer songwriter who gained international fame by coming in 3nd place on the reality show Codigo Fama , 2nd place in La Academia--Última Generación 2008; and 1st place in El Gran Desafío de Estrellas. Since very little, she has displayed an interest in singing, dancing and music. She speaks Spanish, English and Italian. after she ends her contract with TV Azteca in 2011, she starts to creating her musical concept, writing her songs and she released her proyect as Fabiola Roudha. In 2015 she released her first album Esta soy yo and her first single "Nada más que este blues". This blues & pop single become a great success in México and Guatemala, so she released her second single "Dame tu amor" a song with Soul and Pop. By July 2017 she had written new songs,so she decide to start the recording of her second album Más Allá on October 2017. Más Allá is a 7 songs album with soul music, blues, funk and pop in Spanish. Más Allá was released on July 25, 2018 in Guatemala having a special guest, the Mexican Producer, singer and songwriter: Aleks Syntek. ↑ Keegan, Rebecca (January 24, 2014). "Finding a diva in 41 languages". Los Angeles Times . Retrieved February 18, 2014. ↑ La 'triunfita' Gisela, voz de Disney. El País.